Adare is regarded as a fine example of the medieval fortified castle in Ireland and is one of a number of outstanding castles situated in County Limerick. It is sited on the north bank of the River Maigue in a strategic position on a substantial earlier ringwork where it was able to control traffic on the river. It was an important stronghold of the Earls of Desmond. A strong, square keep forms the defensive core of the castle that stands within a walled ward surrounded by a moat. Beside the river is the great hall, with early 13th century windows looking out on to the river, and nearby is a kitchen and a bakery. The Dunraven family home was a typical Georgian house in the 1830s, twenty years later, it was replaced by the exceptional Neo-Gothic Manor that stands to this day. The Manor owes its existence to the 2nd Earl of Dunraven who suffered from gout and was encouraged to embrace this immense undertaking to distract him from the pain of the disease. It was a distraction that would develop and mature into the next generation. The house is initially reminiscent of a chateau, but many of its features are shared by great residences of the era in Britain and Ireland. Mysteriously, the Manor is laid out as a Calendar House. 365 stained windows and 52 chimneys mark the annual tally of days and weeks. Sleuthing visitors may be able to spot references to the 7 days of the week and 12 months of the year. Although there are other examples of such buildings, they are rare, and no one is certain why the Earl determined on this symbolism. This allusive quality is heightened by discreet gargoyles and French or Latin mottoes graven on secluded walls. Flanked by mature coppices, and the river bank, Hardwick`s formal garden runs from the southern aspect of the Manor towards the lush parkland beyond. Lording over Hardwick`s botanic ensemble looms the notable Cedar of Lebanon, the oldest of its kind in the British Isles. This hoary old Samson had already seen out 200 years when Hardwick set to work beneath its branches. Nothing, not even the Manor itself, can claim primacy over it. Until 1982 the Dunraven`s kept their family seat here. The Manor House and 840 acre estate was purchased in its entirety five years later. Today the Manor is a luxury hotel. Bourchiers Castle was built in the 16th century. It was named after Sir George Bourchier, the son of the second Earl of Bath. The Earls of Bath held the castle until 1641. Bourchiers Castle is situated at the neck of a peninsula on Lough Gur near the town of Bruff. It is a ruined five storey tower house. 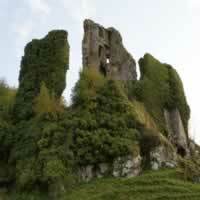 It was also known as Castle Doon, and protected the northern approach to Knockadoon on Lough Gur. The southern approach was protected by nearby Black Castle. The castle itself is not open to the public. 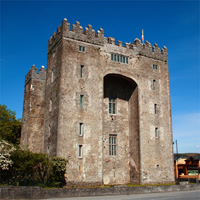 Just over 15-minutes` drive from Limerick city (N18/E20) is one of Ireland`s most renowned and fun attractions, the much-loved Bunratty Castle. Dating from 1425, the castle is the most complete and best-preserved medieval fortress in Ireland and was restored in 1954 to its former glory. It now contains mainly 15th- and 16th-century furnishings, tapestries, and works of art instilling a mood of distant medieval times. Intrepid souls can attend evening medieval banquets during which certain guests may be banished to the dungeons below. The castle is an impressive fortress dominating a natural rocky crag. Carrigogunnell Castle was built around 1450. 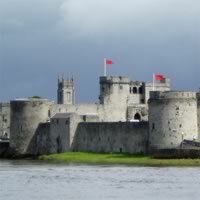 During the Williamite War in Ireland, the castle was occupied by King James II`s troops during the second siege of Limerick in 1691. Later in 1691 Lieutenant-General Scravemore acting for Dutch General Godert de Ginckell captured the castle. The castle occupants were taken as prisoners of war, and later in 1691 Carrigogunnell was blown up on de Ginckell`s orders. The castle is in ruins. The keep was a five storey tower structure with a spiral staircase, and the remains are over 50 feet high. There is a prominent circular bastion. The castle building construction was of cut limestone. On the east side is an adjoining house. Along the western side is a range of ruined buildings. The main gate is on the southern side with a smaller entrance to the west. 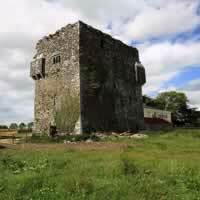 Carrigogunnell Castle is situated near the village of Clarina, on a bank of the River Shannon. 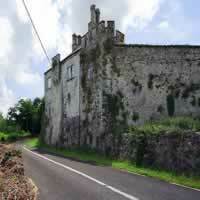 Castle Oliver (also Clonodfoy) is a Victorian mock castle in the south part of County Limerick. Built for entertaining rather than for defense, it has a ballroom, drawing room, library, morning room, dining room and hall which feature hand-painted ceilings, decorated ornamental corbels, superbly executed stained glass windows and stencil work. The lands where the castle stands were settled in about 1658 by Capt. Robert Oliver, one of Oliver Cromwell`s soldiers. The present castle replaced the former Castle Oliver, which stood a thousand yards to the south-west and was the birthplace of Eliza Oliver, mother of the notorious Lola Montez, who became the lover and favorite of King Ludwig I of Bavaria. The castle stands on massive terraces and has a commanding view over much of its former 20,000-acre estate. 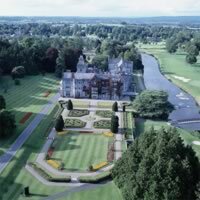 The castle has Ireland`s largest wine cellar, said to hold approximately 55,000 bottles. As of May 2014, Castle Oliver is open to the public in conjunction with Limerick city of Culture for House tours. Croom or Crom Castle, also called the Castle of Crom, is a historic castle in the town of Croom, that is notable for its occupation as one of the principal residences of the Kildare branch of the FitzGerald dynasty. Their ancient war cry and motto `Crom a Boo`, comes from the strategic fortress. Before the FitzGeralds it was the site of an earlier fortress of the O`Donovans. It is located on a strategic bend in the River Maigue, from whence its name Cromadh, or `Bend in the River`. It is believed that the tower castle was built in the early 1200s, following earlier attacks on the town. Today, the castle is little more than a large, undistinguished ruin. Two walls of the tower remain standing, though both have collapsed to about half of their original height, with the other two walls of the tower collapsed into a very large pile of rocks and bricks. The castle is a group of buildings around a courtyard, comprising two stone keeps, or towers; one 15th-century, one 18th-century, a range of workshops and stables and the modernized remains of an 18th-century servants` wing. In 1280 the Norman Fitzgerald family settled at the site, then known as Gort na Tiobrad. The Fitzgeralds married into the local ruling class, the Gaelic O`Colleains and assumed the title Lords of Claonghlais. During the 15th century their descendants built a stone keep. Though unrestored, the keep is largely intact and contains a fine example of a mural staircase (stone steps built within the thickness of the external wall). As the family prospered, a second keep was built during the 18th century to garrison soldiers. In 1691, following the confiscation of their lands by the King of England, the Fitzgeralds left Springfield and returned to France. The property was bought by William Fitzmaurice, a younger son of the 20th Lord Kerry. His son, John Fitzmaurice, built a large three-storey mansion in Early Georgian style, adjacent to the 13th-century keep, which survived until the Irish Republican Army burnt it down in 1921. 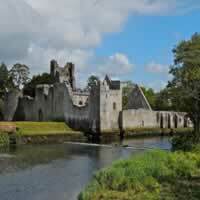 West Limerick preserves many of Ireland`s surviving spacious medieval halls. The Desmond Banqueting Hall is an imposing two-storey structure and was used by the Earls of Desmond for banqueting and entertainment. The Hall, vaulted lower chamber and adjoining tower were all constructed during the 15th century (the hall and chamber were built on the remains of a 13th century structure of similar size). Its restored medieval features include and oak musicians` gallery and a limestone hooded fireplace. In the heart of medieval Limerick City. The stunning new exhibition at King John`s Castle brings to life over 800 years of dramatic local history. 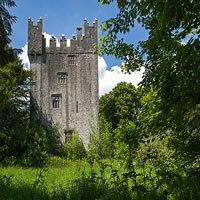 This 13th century Castle reopened on Friday June 28th 2013, following a multi million euro investment. 21st century touch screen technology, 3 D models and discovery drawer are among the exciting techniques that will connect you to tales of siege and warfare. Children will love the dazzling array of computer generated animations and ghostly projections as they travel back through time. The Education and Activity Room is bustling with tasks to stimulate curious minds. In the busy courtyard, you will discover a medieval campaign tent, a blacksmiths forge and scenes from a seventeenth century siege. The sights, scenes and sounds of King John`s Castle and its environs all combine to recreate the atmosphere of the era. 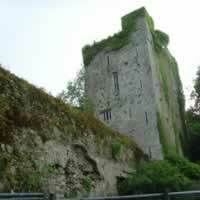 Fantstown Castle stands in a farmyard about two and a half miles east of Kilmallock. It is a five storey fortified tower house about 56 feet high, and although in ruins, it is in fairly good condition. There are prominent bartizans on both the north western and south eastern corners of the fourth storey. There are fireplaces in the side walls of the third and fourth storeys. The fifth storey has a fireplace in the south western end wall. Fantstown Castle has a Sheela-na-gig about 13 feet up on the north corner of the castle, facing north east. 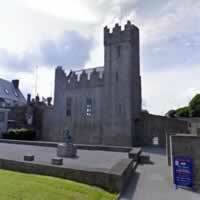 Fantstown Castle was built in the early 1300s by the Fant family. It may have been built as an extension to an existing stone tower, due to construction of corner stones in the North wall. The castle was restructured in the 1600s, with the top half being replaced, and gun turrets added. Glenquin Castle is a square, crenellated, six storey limestone tower house built over four floors which has been partly repaired and re-roofed. On the top floor of the castle there are the remains of stilts which were used by archers responsible for the castle`s defense and also two barrel vaulted rooms. The Irish name of Glenquin means Glen of Shelter, there is very little written about the history of the castle but it is thought to have been built in 1462 by the O`Hallinan clan on the site of an earlier building dating back to 983AD also belonging to them. Glenquin Castle is situated in countryside and woodland, 8 miles south of Newcastle West near the village of Killeedy. Built from local stone the fully restored castle is set in the center of a 500 acre wooded estate with three gothic battlemented folly lodges. It is a plain Georgian castellated house with a colonnaded entrance built over three floors. The castle was originally a long thatch house built by in the 1780`s by Colonel Richard Fitzgerald; Knight of Glin and decedent of the Desmond clan, to replace an earlier ruined medieval settlement. The castle was added to by his nephew John Fitzgerald until 1790 when he incorporated the long house into the west wing. He was also responsible for enlarging the main block by adding a hall, grand double flying staircase, two more reception rooms the drawing room and library. 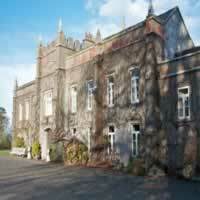 Glin Castle is situated on the banks of the River Shannon, 30 miles from Limerick. 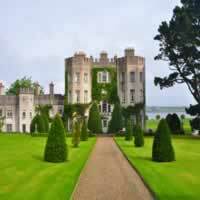 Today Glin Castle is rented out on exclusive basis between March and November and is capable of sleeping up to 30 guests, or seating up to 50 people for wedding receptions and special occasions. 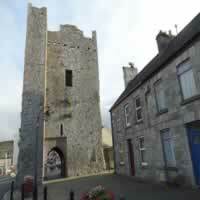 King John`s Castle is a prominent landmark at the north western end of the Sarsfield Street in the town of Kilmallock. The castle is a four storey tower that may have been part of the northern gate entrance to the town at one time. It is sixty feet high with battlements, and two wide arched openings at ground level. There is a public passage through an opening of the basement. King John`s Castle was built in the 15th Century, and is a good example of a `Peel` Tower. It was granted to Henry Billingsley in 1588, and Thomas Browne in 1604. In 1645 it was used as an arsenal by Lord Castlehaven`s troops in the war with Oliver Cromwell, and then was subsequently used as a military hospital in 1651. The tower was renovated in the 19th century with the addition of larger windows and was used for a time as a blacksmith`s forge. 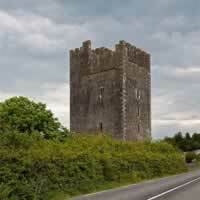 On the outskirts of town of Rathkeale is Castle Matrix, a fifteenth-century tower founded by the Fitzgeralds. Its name may be derived from `Caisleán Bhun Traisce`. However, some experts have linked the castle`s name with the `Matres` or `Matronae`. The Matres were triple mother-goddesses of the pagan Celts, a type of pre-Christian Trinity. James, the Ninth Earl of Desmond, owned the castle in 1487. He was unpopular with his servants, so they decided to get rid of their employer by murdering him. They were made to pay for this action when James`s brother, Maurice, avenged his death by executing every servant they had. Another famous owner of the castle was Thomas Southwell, who rescued 200 Palentine families from Germany and settled them on the grounds of the castle in 1709. 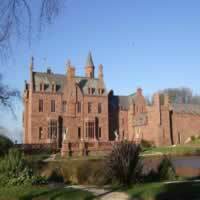 Castle Matrix is also the place where Sir Walter Raleigh met the poet, Edmund Spenser. This meeting inspired him to write `The Faerie Queen`. Edmund Southwell (Thomas`s father) was also a good friend of Sir Walter Raleigh, who often visited the castle. Raleigh presented him with some Virginia Tubers, which he planted in the land around the castle. In 1610, the crop of potatoes was harvested and distributed throughout the province. By the 1960s, the castle had fallen into disrepair. An American called Sean O`Driscoll bought the castle and restored it to its former glory. The castle now has a library containing a collection of original documents relating to the Wild Geese. It is still owned and maintained by the O`Driscoll family.